Enchanted Mesa Show Chorus is an extraordinary group of women of all ages and walks of life who gather together to learn the art of singing four-part harmony a cappella. 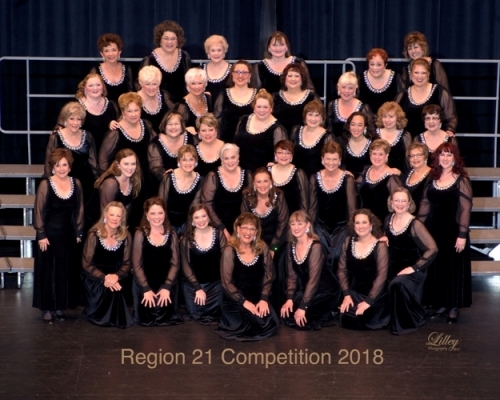 Our chorus is part of Region 21 and we are a proud chapter of Sweet Adelines International. EMSC is pleased to return from our 2019 Region 21 Competition as 2nd Place medalists in Mid-Size Chorus Division AA, and 3rd Place medalists Overall! We love to entertain and have many musical events each year for the community, our friends, and families. The chorus's repertoire includes special arrangements of ballads, contemporary music, popular show tunes, and jazz standards.